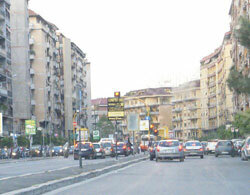 Tiburtina is characterized by low-cost, high rise apartment buildings that went up in the prosperous 1950s. Just about everything is sold along the main road it takes its name from, Tiburtina. This road runs from San Lorenzo all the way to Tivoli, an ancient town just a 50-minute drive from Rome. The streets in this area are often congested. Fortunately, a major railway and an underground station are conveniently located in this district. There are plans to restore and improve this district.